Last year I was working with a mother who had a young child but was wanting ways to work with him without having to go out and buy all sorts of new toys and gadgets. One of the things that I found really helpful when I began doing this was going through our own closets and cupboards to use what we already had. I encouraged her to do the same! I reminded her that the station activities do not have to be complicated, in fact the more basic they are, focused on a certain skill, the better they are. 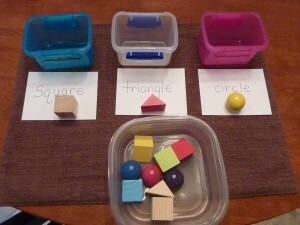 This is an idea that I sent her to help her work with her child on recognizing and discriminating between different shapes. 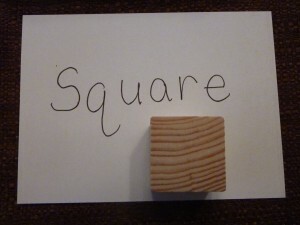 I gathered triangle and square shapes from a building block set and some balls from a hammering game we had. 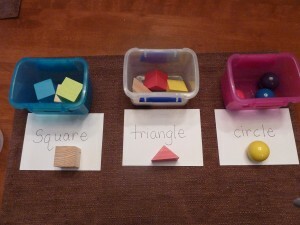 I placed them in a plastic container and provided three empty containers for the shapes to be sorted into. 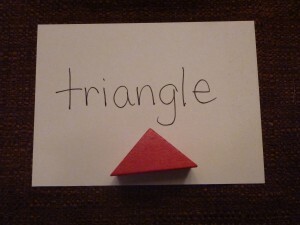 I took some paper and wrote out the shape name while also providing an example (including the example is optional) to add a literacy component and something they can use for reference. Remember that when you are first working on a skill or concept with your child and you aren’t sure where they are with it, start basic and simple. The most important thing is to give them a good foundation. It’s okay to see if they know it without the visual cue, but I recommend having one available. 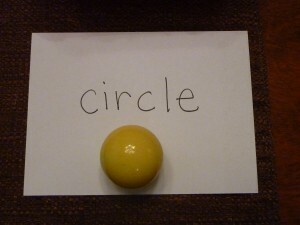 The purpose of this is not to trick them. If it is too easy, take note and make it more challenging the next time.